Action from a recent Peterborough Sports match. Peterborough Sports seek to return to winning ways tonight (February 16) after their perfect playing record in United Counties Division One finally came to an end at the weekend. 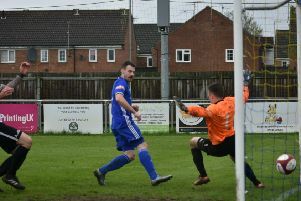 Sports’ failed to make it 22 straight wins on Saturday (February 13) when losing 3-0 at Long Buckby. They have another tough game tonight when travelling to Corby to play third-placed Stewart & Lloyds. Stewart & Lloyds are another team to reportedly boast a big playing budget for this level of football and have won four of their last five league matches. They are 18 points behind leaders Sports, albeit with one game in hand. Wisbech Town of the United Counties Premier Division host Hardwick from the Cambs’ Kershaw Premier Division in a Cambs Invitation Cup semi-final this evening.